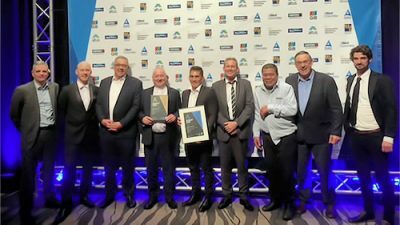 The seismic strengthening and upgrade of Wellington’s St Mary of the Angels Church, won two awards, at the New Zealand Master Builders Commercial Projects Awards. Entered in the “Heritage and Restoration” category, the St Mary’s project took out both Gold and Category Winner medals. The awards were announced Friday, at Sky City, Auckland. With five category Gold, four Silver and one Bronze medals awarded, construction company, LT McGuinness faced down strong competition. Brian McGuinness, Managing Director of LT McGuinness is thrilled to win the award. He described the job as a “heart and soul project”. The priest who oversaw and fund-raised for the seismic strengthening of the Church, Fr Barry Scannell SM is excited by the award. “It’s a fantastic recognition, particularly for LT McGuinness”, says the former Parish Priest, speaking Sunday after Mass, from his new parish of Napier. 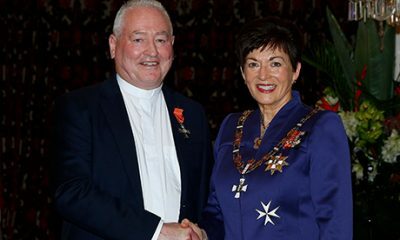 Fr Scannell, Wednesday, received the MNZM at Government House, Wellington, from Governor General, Her Excellency The Rt Hon Dame Patsy Reddy, for services to the community and heritage preservation. In 2017 Kerrin Manuel of LT McGuinness won the James Hardie Innovation and Excellence award for finding an innovative solution which materially benefited the St Mary of the Angels project, but which also provides longer term benefits for the construction industry.